Happy Monday! More specifically, happy Meatless Monday! (At least for another hour and fifty-three minutes). Can I let you in on a little secret? We’ve not just gone meatless Mondays anymore, but meatless Tuesdays, Wednesdays, Thursdays, Fridays, Saturdays and Sundays as well. Yep. We’ve gone vegan. I can’t say for certain this very moment if this will be a lifelong lifestyle, because I have a feeling that somewhere down the road I’m going to have a hankering for Anthony’s alder-planked salmon, but I can say that I plan to be a 99% vegan. I think that makes me a flexitarian. So here’s my new favorite recipe. This was a clean-out-the-fridge recipe that worked beautifully. And here’s how I know it worked so well: Dave told me THREE times during dinner that it was good. That means he for reals liked it. And today you get a two-fer. 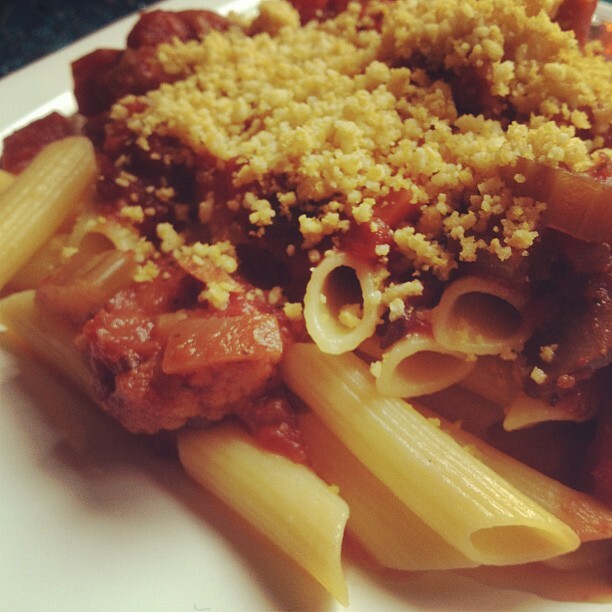 The second recipe is for deLISHous vegan almond “parmesan” cheese. To be truthful, I like this better than the real thing. And zero animal products. We can talk later about why that’s a good thing. First, the sauce. This is easy, easy, easy. Only the waiting is hard. Put diced tomatoes and tomato paste in a six-quart crock pot. In a 12″ frying pan, heat half of the olive oil, then add the onions and cook five minutes. Add the celery and cook another three minutes. Add minced garlic and cook another three minutes. If needed, add a little water. Pour the onions, celery and garlic in the crock pot, then saute the carrots, bell pepper and cauliflower in a little water till soft. Put in crock pot, then use the same pan to saute the mushrooms in a the second TBSP of olive oil for about five minutes, stirring often. Deglaze the pan with the red wine and pour all into crock pot. NOTE: You may have noticed that I didn’t add any salt to this list of ingredients. That’s because I’m doing all I can to eliminate salt from our diet. I’ll probably be adding in some sea salt, but until I go shopping, I’m not using iodized salt. Unless you’re going “no-salt,” you will definitely want to add some salt to this. The tamari (or soy) will help, but not enough unless you’re used to salt-less food. 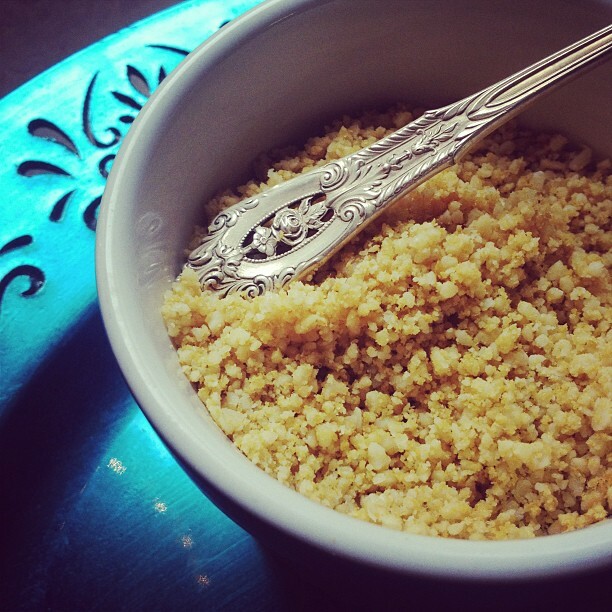 In a food processor, blend the almonds and nutritional yeast until the almond dissolves into little granules. (You might want to pulse this so it doesn’t turn into almond butter.) Add the garlic powder, then add the olive oil, a drizzle at a time, until it looks like parmesan cheese. You’ll know. Warning: this is utterly delicious. Try not to eat the entire batch before you serve dinner. A quick note: If you’d like to know why we’re going in this direction, google Eat To Live by Joel Furhman, or Engine 2 by Rip Esselstyn.